My name is Bastien Mensink. I live in The Netherlands, together with the love of my life, my wife Monique and our 9 year old son Melle. Mountain biking is a great passion of mine (and a good way to hide my nerd-image) furthermore I also like geocaching, photography, hiking and listening to music. The first time I started using spreadsheets was in 1994 during my study (environmental engineering). Almost immediately I was addicted to spreadsheets. They made my calculations and modeling so much easier and visually attractive. After a few years of Lotus 123 and Quattro Pro I started working with MS Excel in 1997 because the company that I worked at switched from Lotus to Excel. Most of the times I use Excel it is for modeling, enhancing and automating reports or converting data. Many of my former colleagues in 1997 created their reports manually and performed several manual comparisons. I showed them how to use Excel to perform comparisons and create reports and models much faster and reduce the chance of typographical and mathematical errors. My background/education is environmental engineering. I worked in this area for about five years. Half the time of my job I was investigating sludge/dredged material, the other time I was responsible for developing and maintaining software applications that were used in my department. In this function I soon became the departments "excel-expert". All sorts of questions came to me. Some were easy to answer; other questions required the use of macros. I soon found out there were many questions that were repeated over and over again. When I talked to friends of mine I found out that most of these questions weren't exclusive to my company but more general. 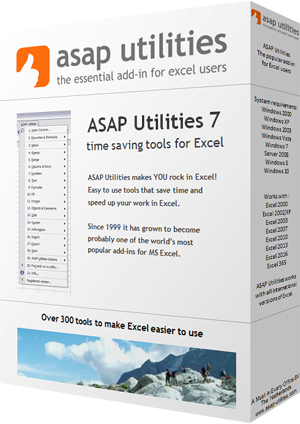 It was in 1998 when I started to write my own add-in for Excel; ASAP Utilities was born and many evenings and weekend were filled writing macros. It felt good to see how many of my colleagues and friends were helped with my little Excel add-in. In 1998 I started building websites as a hobby. In February 1999 the first ASAP Utilities website was launched and everybody was able to benefit from the tools in ASAP Utilities. 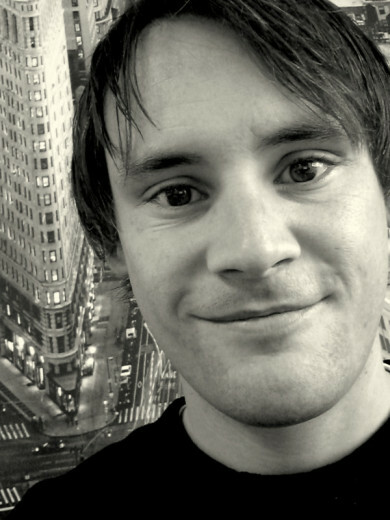 In 2000 I started my own company, eGate Internet Solutions (Dutch). We mostly perform online marketing for websites (e.g. optimizing performance in search engines) and create custom Excel tools and automate reporting. We started our company with a lot of ideas, enthusiasm and our expertise, with just our own savings. Initially our office was at home. We steadily grew and build a network of clients. In February 2005 we moved to a beautiful building in the city-center of Zwolle. An inspiring and stimulating office! eGate has evolved to become a professional and reliable company where quality in products and marketing combined with good communication with our clients has led to many successful projects and satisfied customers. With most of our clients we have built a stable relationship that exists for several years. In my humble opinion I believe ASAP Utilities is a must in every office. I use it myself on a daily basis, and it saves me an incredible amount of time. On our website we have listed several reviews from independent magazines and websites about ASAP Utilities. In 2007 I started the company A Must in Every Office BV, with the main purpose to further develop, professionalize and promote ASAP Utilities, which makes Excel easier to use. In 2008 we have also spent a lot of time and effort to make ASAP Utilities ready for other languages. Starting from 2009 ASAP Utilities is also available in Dutch and in September 2009 the German language was added. In November Spanish was added and in December the French language. By adding more languages we believe that many more people can benefit from ASAP Utilities and make their life in Excel easier. In 2010 A Must in Every Office moved to its own office. Starting from May 2016 ASAP Utilities is also available in the languages Portuguese (Brazil), Italiano (Italian), Russian, Chinese (Simplified) and Japanese and we've also created a 64-bit edition for the power-users with the 64-bit edition of Excel. By offering a free version of ASAP Utilities (already since 1999) I want to contribute to society. The free "Home&Student" edition of ASAP Utilities is free to use for home projects, schoolwork and charitable/non-profit organizations such as for example MSF, Amnesty International, Unicef, etc.. Especially with providing it for free to students and charitable organizations, I hope to contribute to a brighter future. Enjoy every moment of your life, respect your environment and make yourself useful. If you require any further information, feel free to contact me or connect on LinkedIn.